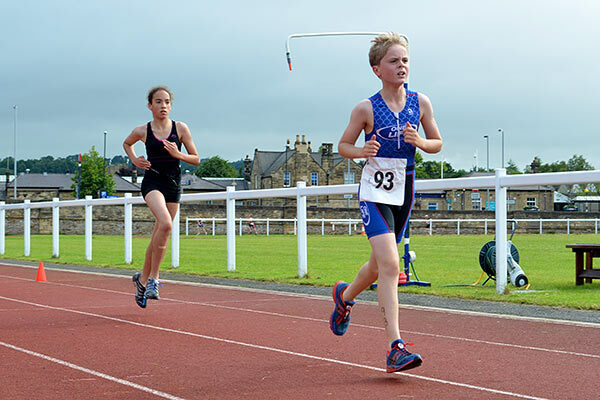 We are one of the North East’s largest triathlon clubs for both children and adults. Based in Hexham, One Life Racing is a community oriented club that provides the chance to try out, train and compete in the combined sport of triathlon. Whether you are a complete beginner or an experienced triathlete, we pride ourselves on welcoming athletes of all ages and abilities. We are a friendly club with a vibrant social scene and our ethos is simple – it’s about taking part and having a lot of fun along the way, while supporting you in reaching your goals. It’s an ethos which has produced some fantastic talent in all age groups. Triathlon is a multi-sport event involving the completion of three continuous and sequential endurance events – swimming, cycling, and running – in immediate succession, over various distances. Triathletes compete for fastest overall course completion time, including timed change-over points or ‘transitions’ between the individual components. Transition areas are positioned both between the swim and bike segments (T1), and between the bike and run segments (T2) and are where the switches from swimming to cycling and cycling to running occur. These areas are used to store bicycles, and any other accessories needed for the next stage of the race. The times spent in T1 and T2 are included in the overall time of the race. Can I take part in other kinds of multisport? You can also take part in other multi-sport variations, such as duathlons (a run, followed by a cycle, followed by another run) and aquathlons (a swim, followed by a run). If I chose to compete what distance would I race? 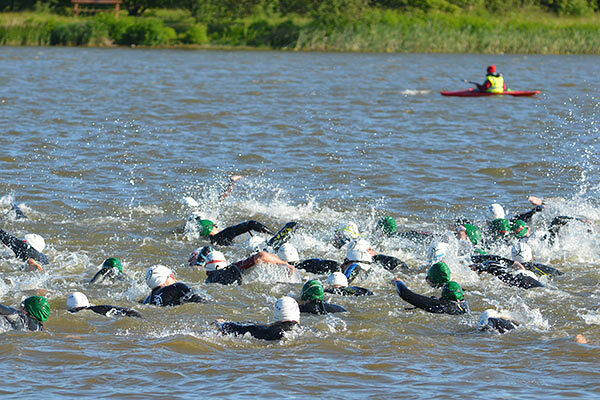 Triathlon races vary in distance. According to the International Triathlon Union, the main international race distances are Super Sprint distance (400m swim, 10km bike, 5km run), Sprint distance (750m swim, 20km bike, 5km run), Intermediate (or Standard) distance, commonly referred to as ‘Olympic distance’ (1.5km swim, 40km ride, 10km run), the Long Course (1.9km swim, 90km ride, 21.1km run, such as the Half Ironman), and Ultra Distance (3.8km swim, 180km ride, and a marathon: 42.2 km run); the most recognised branded Ultra Distance is the Ironman triathlon. What distances do juniors race? Juniors compete over distances that vary according to their age. Children are classified by their age on 31st December in the year of the competition being undertaken. What kit do I need to take part in triathlon? There is no need for an expensive investment in kit when you start triathlon. You probably have everything necessary already. For swimming: a costume or trunks, goggles, swim hat, towel. For cycling: comfortable stretchy shorts / leggings, T-shirt, trainers, helmet, gloves. An ordinary hybrid or mountain bike is fine for beginners. For running: shorts, T-shirt and trainers. A drink should be brought to all training sessions, together with warm, windproof/waterproof layers as the weather dictates. There are one or two items of more specialist equipment, specific to the sport, which you may wish to have as you progress. Trisuit: A trisuit is an all-in-one set of cycling shorts and top joined together, which can be used for the swim phase of a competition and also for the bike and run, eliminating the need to change clothes or put on an additional T-shirt during transition. Trisuits are not usually worn for training (except specific sessions), only for competitions. When juniors first join the Club it is not essential to have a trisuit as they can easily compete in their swimming costume, putting on a T-shirt for the cycle and run phase. However, as they progress in the sport, they may wish to have a trisuit in order to speed up their transitions. Number belt: A stretchy belt to which a race number can be attached during competitions, and is worn with a trisuit. Again, this is not essential for younger juniors as their number can be pinned to their T-shirt. 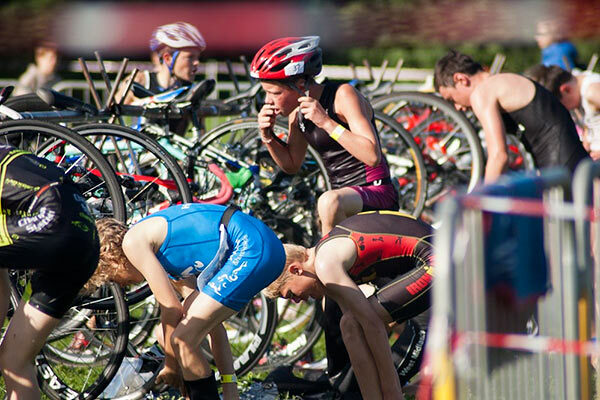 Bike: As a new member you may notice both adults and the older juniors using road/racing bikes. However, most children’s competitions are held on grass and the average child’s general-purpose bike is perfectly adequate – a road/racing bike is not necessary until such time as your child progresses or shows particular enthusiasm and dedication to the sport. The Club owns a number of road bikes which can be rented out on a short-term basis, either for triathlon competitions in the summer, or (with different tyres) used for cyclocross in the winter. Club branded kit: The Club produces various items of branded clothing for purchase. such as hoodies, fleeces, technical T-shirts, trisuits, cycling tops and shorts, swimming hats and caps. More about this can be seen here.